This is our ninth Case of the Week.� These cases can also be accessed by clicking on the Case of the Week button on the left hand side of our Home Page.� This email is only sent to those who requested to be on this list in writing or by email.� To view the images or references, you must click on the links in blue. This week�s case is sponsored by our Books page, which is revised weekly with new titles of interest to pathologists.� You may need a book in a particular area of pathology, but how do you know what books are available?� Our Books page lists all books of interest to pathologists available from Amazon.com, published since 2000, and organized by subspecialty topic and by author.� Each book listed is accompanied by the publication date, a description, links to book reviews and links to Amazon.com or the publisher for purchase.� Contact us to add any books that we missed or to post a book review that you wrote. A 47-year-old man complained of intermittent chest pain for some weeks and a chest x-ray revealed a 2.5 cm pleural-based lesion. Clinically, diagnoses such as fibroma, mesothelioma or carcinoma were considered. 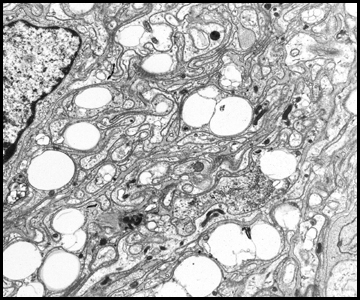 A fine needle aspiration biopsy was performed.� Adequate fragments of tissue were obtained and a cell block was prepared.� Fragments from the needle rinse were also prepared for electron microscopy. 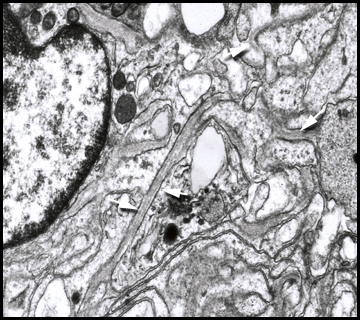 Micro description: The FNA fragments consisted of cohesive spindle cells with indistinct cell membranes and fibrillar cytoplasm.� There was focal palisading of the nuclei, which were oval and slender and either short or elongated with inconspicuous nucleoli. �Chromatin was finely granular. 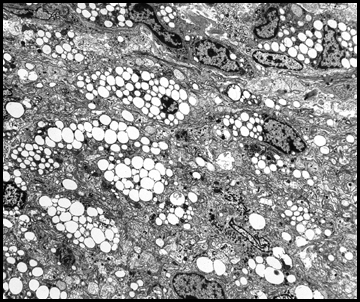 EM description: �Image #1 shows compactly organized spindle cells with numerous cytoplasmic lipid droplets.� Images #2 and 3 show numerous, narrow cytoplasmic processes, which were intricately associated and intertwined, and had external lamina on their outer aspect (white arrows).� The cytoplasmic processes contained only infrequent organelles. This combination of features was diagnostic of a schwannoma, apparently developing from an intercostal nerve. 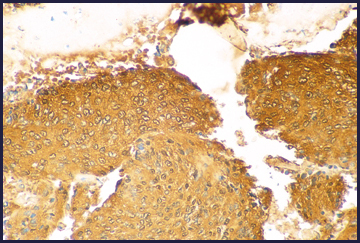 The diagnosis was confirmed by S-100 protein immunostaining of the cell block, which was diffusely positive (image).� In this case, according to the contributor, the H & E�s by themselves were not considered to be diagnostic, and ultrastructural diagnosis saved the patient the discomfort and expense of a thoracotomy.� When the benign nature of this small tumor was explained to the patient and the therapeutic treatments considered, he opted not to have the lesion resected. �At follow-up three years later, the patient was asymptomatic and the schwannoma had not substantially increased in size. 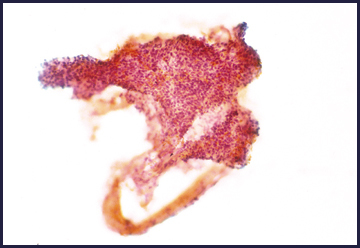 The diagnosis of schwannoma may be difficult from an FNA, due to hypocellularity that makes the FNA non-diagnostic, cellular material that resembles granulation tissue or granulomatous inflammation (Cytopathology 1999;10:186), or the inability to rule out other spindle cell tumors. 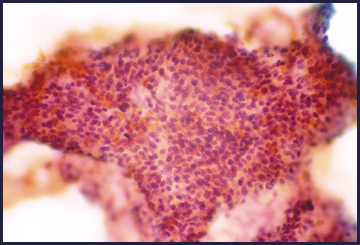 The typical fine needle aspiration of schwannoma shows aggregates of spindle cells with indistinct cytoplasm, and elongate nuclei with blunt pointed ends.� The chromatin is finely granular and uniformly distributed, and nuclear inclusions may be present.� Occasionally, nuclear palisading is found, but Verocay bodies are only rarely present.� Nucleoli are not prominent.� No isolated tumor cells are seen.� Schwannomas can have degenerative features (�ancient schwannoma�), resulting in nuclear pleomorphism and mimicking sarcoma.� However, the chromatin of ancient schwannomas is homogenous and smudged.� Mitotic figures are usually not seen. 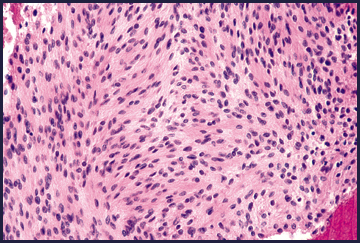 Additional references: Weiss: Enzinger and Weiss�s Soft Tissue Tumors; 2001 (4th edition).